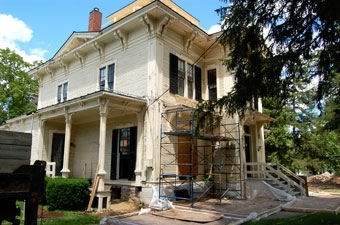 Once the stately home for several Middlebury College presidents, as well as the College’s first women’s dorm, this campus and town classic at 152 College Street, directly across from Twilight Hall, is being restored to its former glory for use as college offices. The College recently purchased the property, on the corner of Weybridge and College streets, which had been in private hands for several decades, and began the renovation process. In this video "Dispatch" at the Middlebury Magazine Web site, you can see the building and hear what project manager Tom McGinn has to say about the process and the location’s historical significance.